A prominent local developer will build two towers next to Boston’s Christian Science Plaza, shaking up a signature open space with what will be one of the tallest buildings to hit the city skyline in years. One tower will rise up to 50 stories, containing a hotel, condominiums, stores, and restaurants. The other will be about 20 stories and include apartments and additional retail space. The city has already approved the broad outlines of the project, and construction could begin by the end of this year. Developer Carpenter & Co. of Cambridge was selected to develop the property, at Belvidere and Dalton streets, by the First Church of Christ, Scientist, which has been working to bring new buildings to its sprawling Back Bay campus for several years. Although the project will fill in open space used by the public and a parking lot, the triangular plot is separated from the main plaza and is something of a dead zone between a church-owned office building and the Prudential Center complex. So far, little opposition to the proposal has emerged. 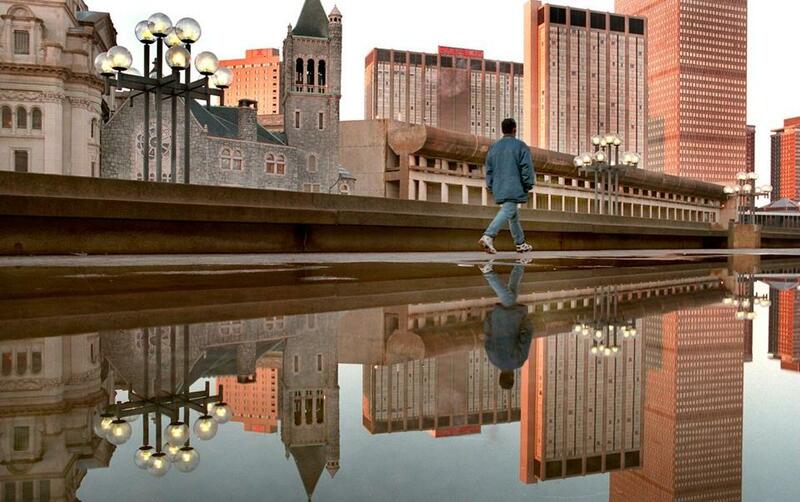 The new buildings are part of a broader plan approved by Boston regulators in 2011 to redesign the 14.8-acre plaza, including its iconic reflecting pool. It allows for three towers containing more than 950,000 square feet of space, as well as public lawns and stores. Final plans for the reflecting pool are still being devised and will need approval from the Boston Landmarks Commission, which has granted protected status to the pool and plaza. Additional public meetings will also be held on the design of the new towers. 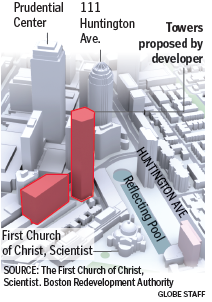 Carpenter & Co. has won the right to build two of the three buildings around the plaza; the church has not yet selected the developer of the third building, along Huntington Avenue. Carpenter has hired New York-based Pei Cobb Freed & Partners and Cambridge Seven Associates as architects. 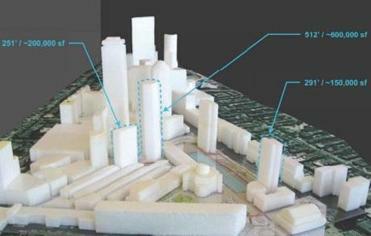 Plans for the towers at the Christian Science Plaza. Pei Cobb Freed designed the current layout of the plaza in the late 1960s, and principal Henry N. Cobb, who will lead Pei Cobb’s efforts on the project, also designed a number of notable buildings in Boston, including the nearby John Hancock Tower. The new towers will extend the commercial spine of the Back Bay, which drops off precipitously as it approaches the church’s property. The cochair of a city panel that reviewed the project, George Thrush, said the new buildings will bring more activity to the area without fundamentally altering the character of the plaza. He said new shadows created by the buildings will fall mostly on the Hilton and Sheraton hotels, and not on the plaza, which is the largest privately owned urban open space in Boston that is accessible to the public. Carpenter & Co. has developed a number of high-end hotels and residential projects locally, including Boston’s Liberty Hotel and the Charles Hotel and Residences next to Harvard University. Friedman said the project will be similar in scope to another of the firm’s major developments, the St. Regis San Francisco Hotel and Residences. That project, in the city’s Yerba Buena Arts District, consists of a 42-story tower with 270 luxury hotel rooms and 102 condominiums, along with restaurants, a health club, and a 20,000-square-foot museum. “This kind of project has been very successful in other cities,” said Friedman, who is still trying to get funding for the buildings next to the Christian Science Plaza. The project carries with it the inherent difficulty of reconciling modern buildings and secular uses with the traditions and design sensibilities of the church, which holds services and meetings on the property, and operates a Sunday school and reading room. Friedman said restaurants in the complex will have liquor licenses, although his firm is working with the church officials to contain those activities that would clash with Christian Science beliefs, which include encouraging members not to drink alcohol. The church emphasizes that spirituality and a deep connection with God can resolve challenges involving relationships, health, employment, and other matters. Barbara Burley, manager of real estate for the church, said the development of new buildings will help to finance upkeep of its massive property. The plaza has been an integral part of the Back Bay landscape for more than 130 years and serves as a destination for thousands of visitors, neighbors, and tourists. The plaza currently has seven buildings and about 10 acres of open space. The redevelopment plan also includes a third building along Huntington Avenue and a small retail pavilion at the corner of Huntington and Belvidere. But those project are still years away. Carpenter will be responsible for the design, financing, construction, and maintenance of the two buildings along Dalton and Belvidere. The church will collaborate with Carpenter during the public review process. After approvals are obtained, Carpenter will take full ownership of the building sites.